As a quite big kit lens, this lens is and was usually shipped in three different revisions with the bigger NX Cameras like NX11, NX20 and NX30. Further more it is also available to the NX300 and NX310 Series. Its advantage is a built in OIS stabilizer, a switch for changing between manual and automatic focus and a big range of focal lengths starting at 18mm and ending at 55mm. Being a quite compact lens, which can also be locked into a even smaller travel position, this lens is usually shipped with NX Cameras like NX100, NX1000, NX2000 etc. 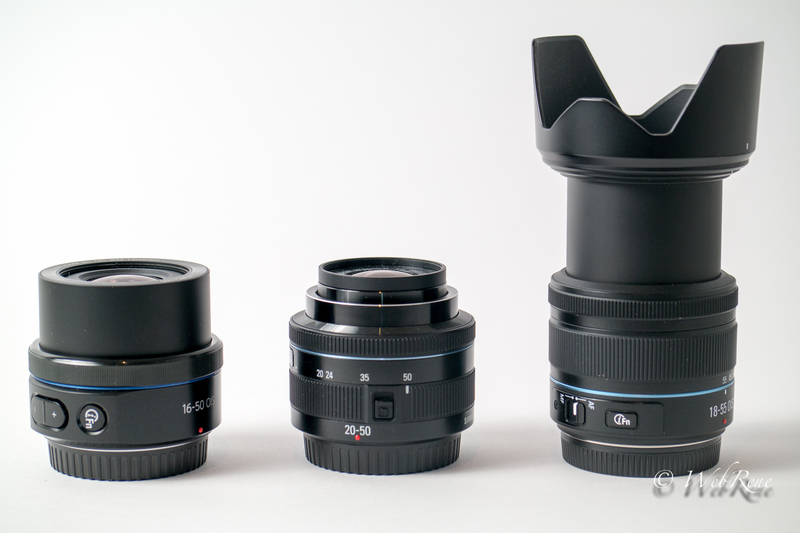 As a very new model, this lens is available in a bundle with the latest NX30 Camera. Its advantage is the really compact size, the OIS stabilizer and the motorized powerzoom for taking videos and the very low focal length of only 16mm. Finally, as the top model if its range, Samsung also offers a very fast standard zoom lens, which is not respected in this comparison, since it is still quite expensive and heavy. For the comparison I did some research and found out, that when taking identical pictures, it shall be enough to compare the RAW Files Sizes in order to find out about the level of detail in each picture. Since I do not own a professional studio with units for measuring things like line pairs per milimeter – which would actually represent the real strength, I decided to fall back to this simple method. Furthermore, I created some cut outs from the middle of each picture to show the differences in detail depending on the focal length and the aperture. 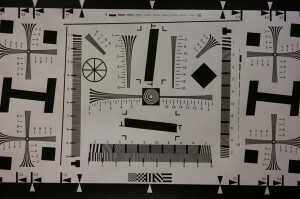 Although the test is not a 100% measurement of line pairs per mm, it gives us a feeling of the lenses performance and show that the characteristics of all lenses is quite different in each focal length. 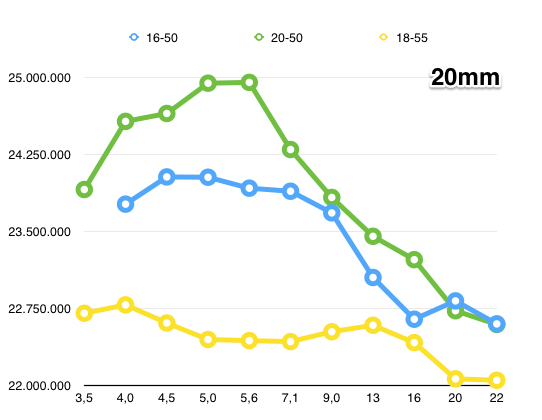 Starting with a focal length of 20mm, the medium compact 20-50mm leads the field, followed by the new 16-50mm. Bringing up the rear, we have Samsungs 18-55mm lens with a quite bad performance in the middle. When having a look at the edges, we get the worst results with the new 16-50mm powerzoom which is getting quite soft at the edges. When it is coming to a focal length of 35mm, Samsung new 16-50mm catches up with big aperture loosing its lead at an aperture of 7,1. 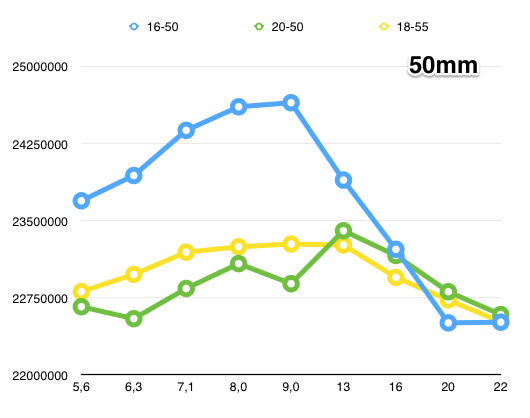 Finally, when reaching the top of 50mm, the new 16-50mm overtakes the other lenses by far, only loosing the lead at the last F-stops of 20 and 22. In the end, all of the lenses do perform quite good and it is up to you to decide which one suites best for your purpose. 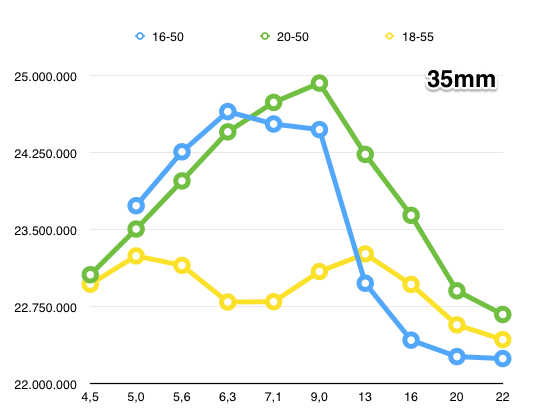 But mention one thing: The new 16-50mm looses when having a look at the maximum aperture at the lower. 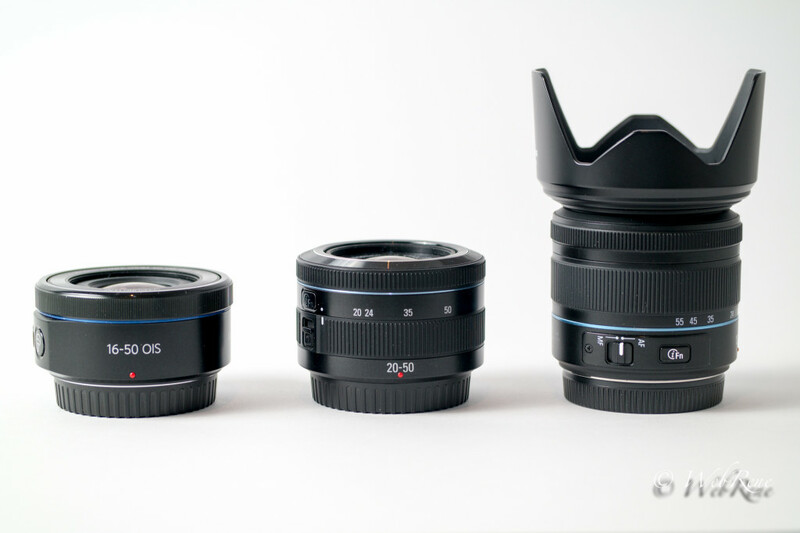 When it comes to 20mm, the new lens only offers a maximum aperture of 4,0 whereas the other two competitor do already allow a faster setting of 3,0. Same at 35mm where it is F/4.5 at the other two lenses but only 5.0 with the new powerzoom. Nice comparision, i just got a nx1100 with 20-50 and i am trying to make my opinion. Actually i think that main issue is the lack of OIS. I wander if the better performance of the other 2 kit lenes at 50mm should not be due to ois itself. Did you try the the OIS lenses with the stabilization set to off? Acutally, I did not disable OIS for this comparison, but every shot was triggered remotly with the Camera mounted on a tripod, which I guess should not make a difference at the end between OIS or not OIS. Thank you Rene, yes i mean the 16-50. Indeed the “big brother” is a stunning lens with “pro” vocation, but the 16-50 ois should do the trick for me, my nx1100 is intended to be a high quality compact rather than a dslr aletrnative. I have a sony with 50mm prime for the dslr “job”! Long time ago i read that OIS makes some difference on tripod usage too, since it contrasts the microvibration from the shutter action. Dont know if this is the case! That’s a nice statement. The 2-2.8 rather fits the NX30 or NX1. Then again… I’m used to my Canon DSLR’s, so no compacts or bridges for me. And between Olympus E-PM2, Fuji X-E1, Sony A5000, and even Canons M3… this is a clear winner. So I’d like a 2-2.8 too. Maybe even a NX1. No adapters needed between the two: just plug and play. Advantage of being a new player to the game. Then again: no full frame options. Well… not now. And that would require an adapter and a crop view setting. I like the new ecosystem, especially like it coming full option with wifi and all included and no holding back on smaller models (same sensors and AF and all inside). Thanks Rene for your thoughtful analysis. Thanks for the comments. I am really torn about this. Obviously the new pro lens will deliver better results over the entire range, but wil I use it to its maximum effectiveness? I doubt it. I prefer a lens with its strengths at the long end, so the 16-50 PZ looks pretty good here. actually i’m considering in buying an nx3000 to get started to advanced photography and i have pretty nice offers with 20-50 lens (198€) or 16-50 lens(217€). I guess size is pretty much the same, as i primarly search for portability, thus what bundle would you choose? Well to be honest, I would prefer the 16-50. Why? Because it is smaller and more portable, it has an OIS and the motorzoom is great for filming. I almost cannot believe to read this, that someone can think to do a resolution test for lenses without switch off the stabilizer when mounting the camera on a tripod and then put also this distorted test, on the web, giving obviously wrong informations! thanks for your thoughts. You are right, that one should disable the stabilizer when shooting on a tripod. Especially with long time exposure, it will certainly affect the outcome. But also with short time exposure as used here there is a possible risk that a not perfectly calibrated giro will try to stabilize something not moving and lead to less resolution. Nevertheless newer cameras try to recognize when mounted on a tripod and avoid stabilization. To be honest, I am not sure if this implemented in Samsung as well. To have a perfect test, this should definitly be retried without stabilizer activated and for a perfect test – for sure – just validating with the eye and by filesize is not enough either. Well, I appreciate that you have agreed to publish my constructive criticism and your honest reply.